When you order from Marlin Crawler, Inc., you aren't just buying the strongest and longest lasting products on the market. 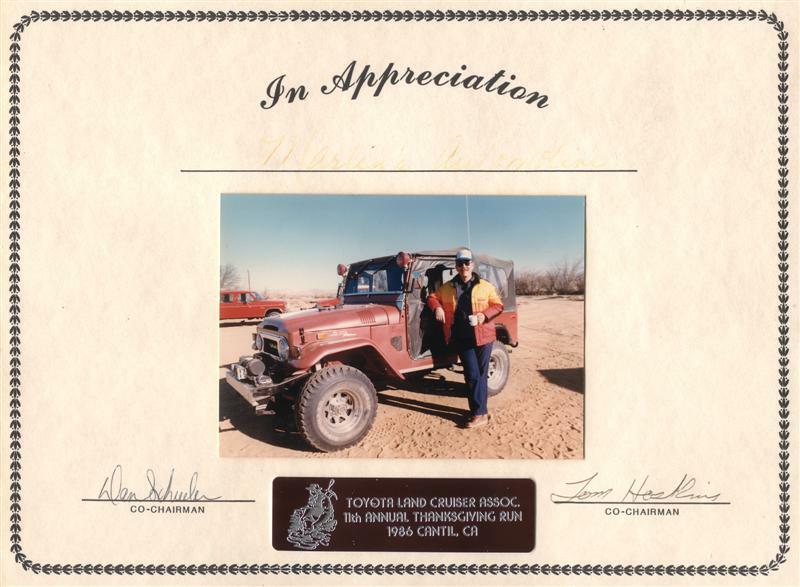 You are buying a piece of heritage and prestige unparalleled in the Rock Crawling industry. 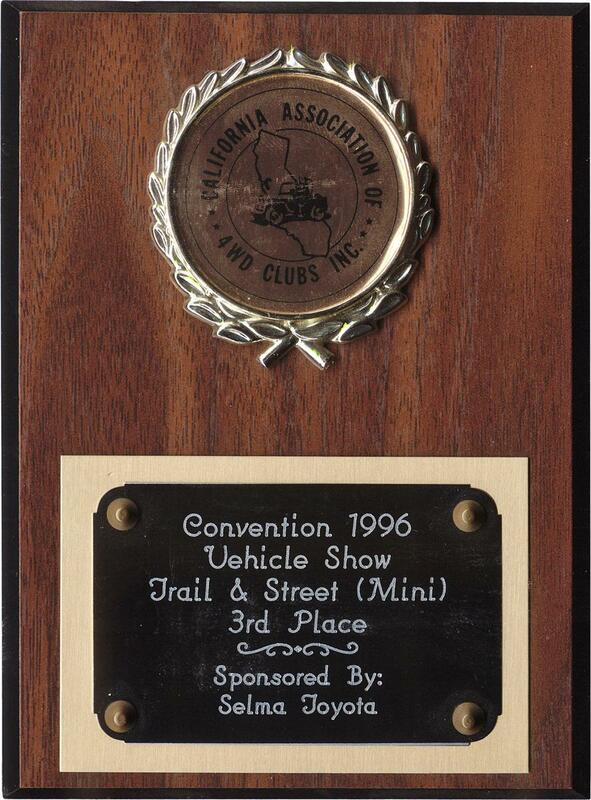 Early in 1984, Marlin became a California Association of 4WD (CAL4WD) member as well as a Toyota Land Cruiser Association (TLCA) member. 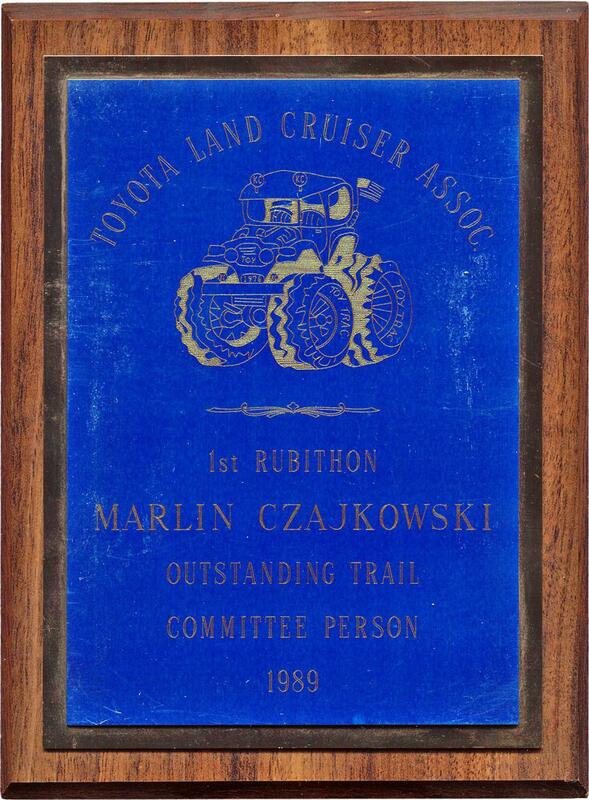 Twenty-five years strong, Marlin has amassed arguably the largest reputation in Toyota Rock Crawling today, and it came through many, many drops of sweat and blood and sleepless nights all for the advancement of the hobby he holds so dear... Toyota Rock Crawling! With such an outstanding reputation, it is no wonder why Marlin Crawler products are far superior and better engineered in such a way that they easily out-perform, out-last, and surpass all other products. 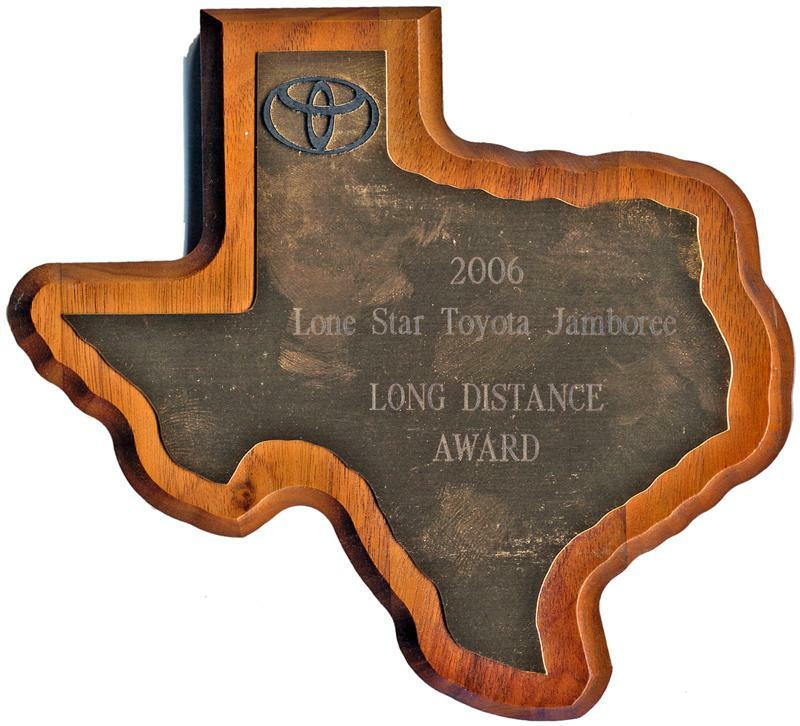 If you can't decide where to order from for any reason, choose the company who gives back the most to the Toyota 4WD community... choose the only company who made it possible for Toyota trucks to do what they are capable of doing today... choose the only company based on a 25 year proven track record... choose the most decorated company with the most advanced products... choose the father of Rock Crawling... choose Marlin Crawler! 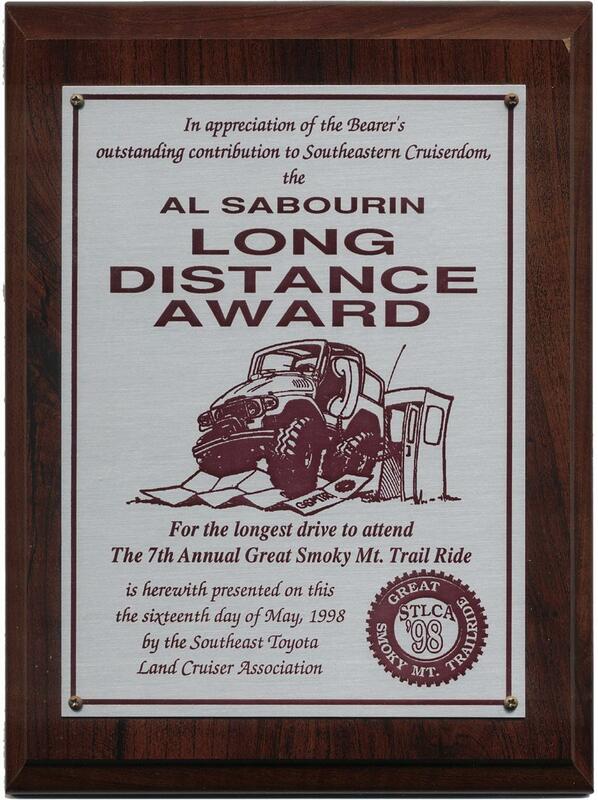 Marlin receives an award for "Outstanding Trail Committee Person" from the very first TLCA Rubithon event in 1989! 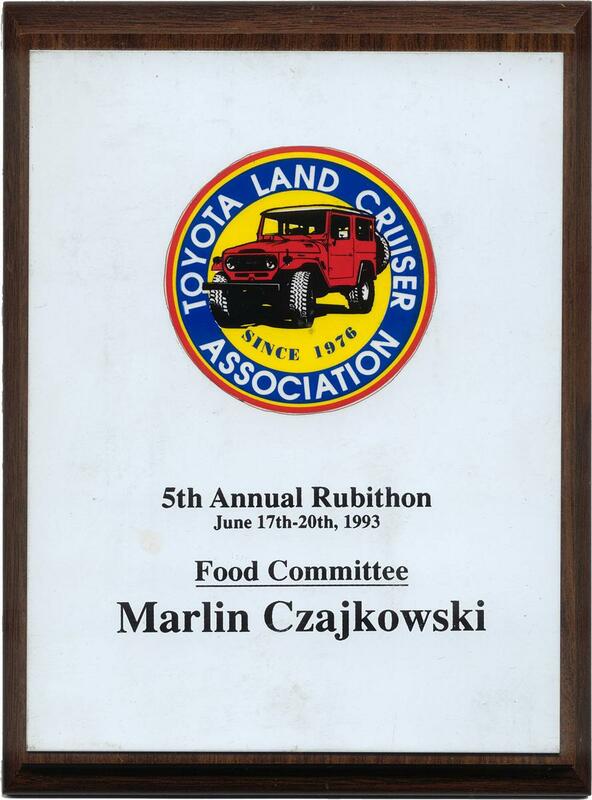 Since 1989 Marlin has only missed 1 annual TLCA Rubithon event! 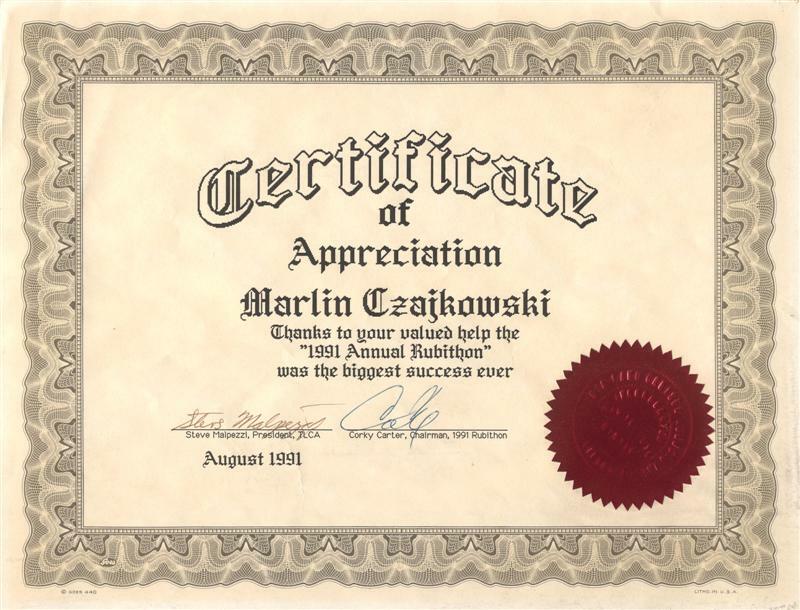 Marlin receives a Certificate of Appreciation from the 3rd annual TLCA Rubithon of 1991. 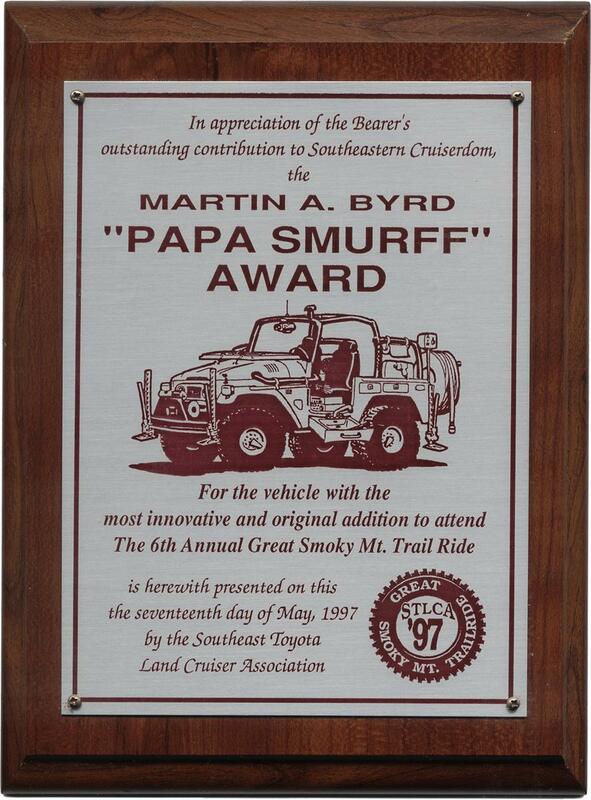 Marlin is recognized for his assistance in helping feed the hundreds of fellow wheelers who attended the 5th annual TLCA Rubithon event in 1993. 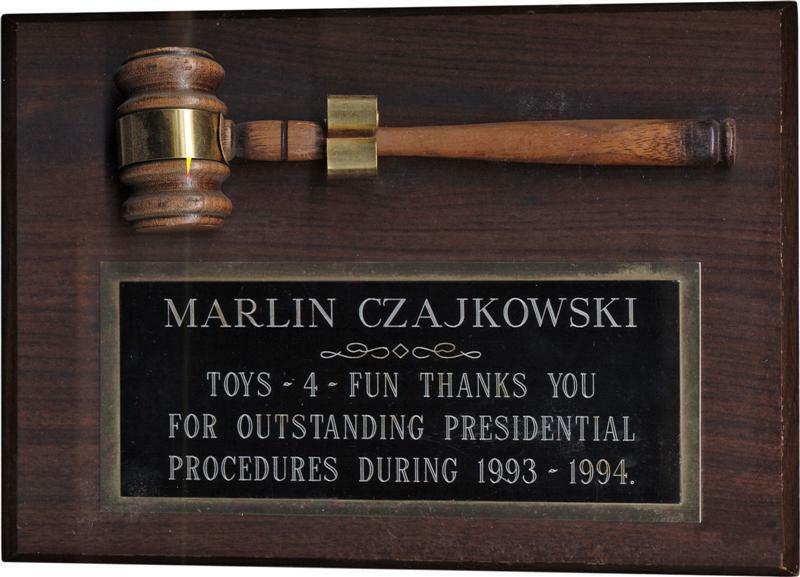 Marlin is acknowledged for being "Outstanding Presidential Procedures" for the TLCA Madera-chapter Toys-4-Fun club in 1993 & 1994. 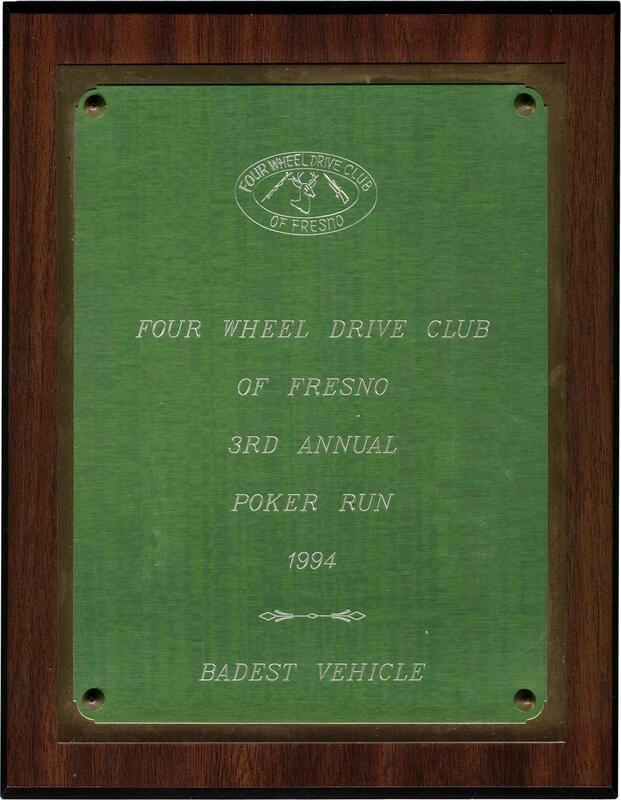 Marlin receives an award for the "BADEST VEHICLE" at the Four Wheel Drive Club of Fresno's 3rd annual Poker Run from 1994. 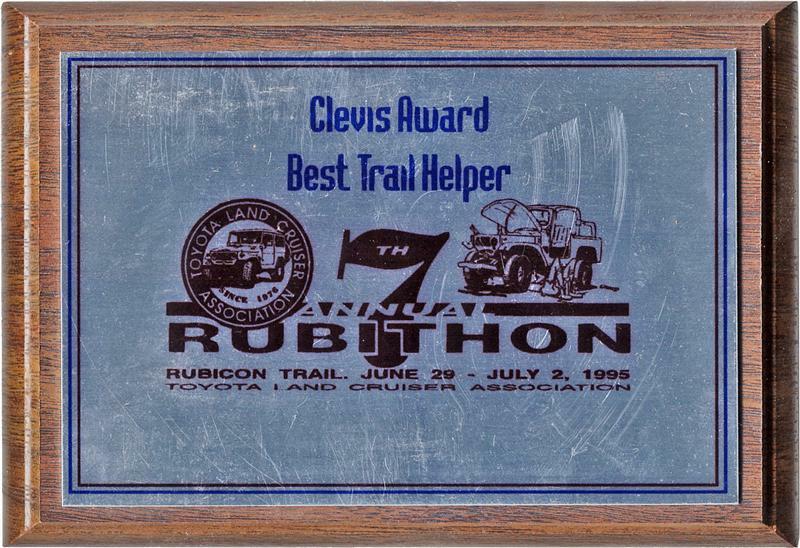 In 1995 at the 7th annual TLCA Rubithon, Marlin is awarded as being the "Best Trail Helper", an award known as the Clevis Award. 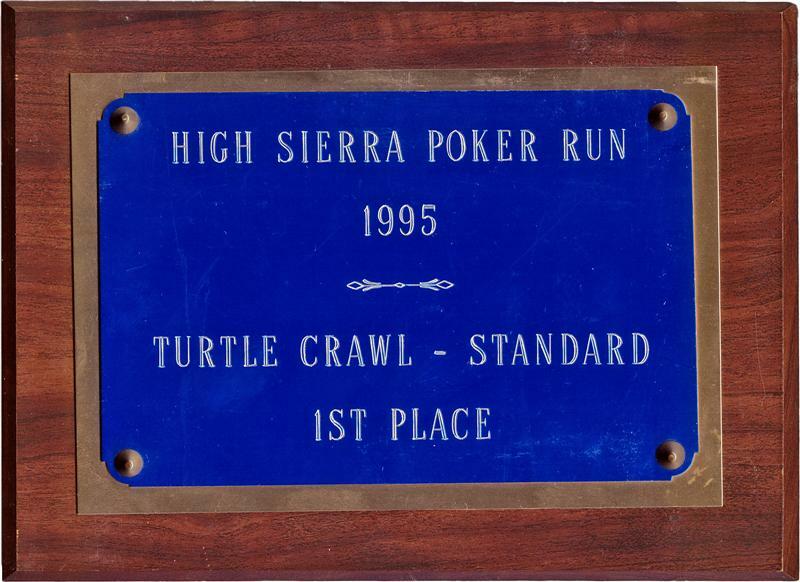 Marlin receives an award from the 1995 High Sierra Poker Run for winning 1st place in a Turtle Crawl race. Marlin completely dominated this beating the 2nd place winner by nearly 1,000 seconds!!! 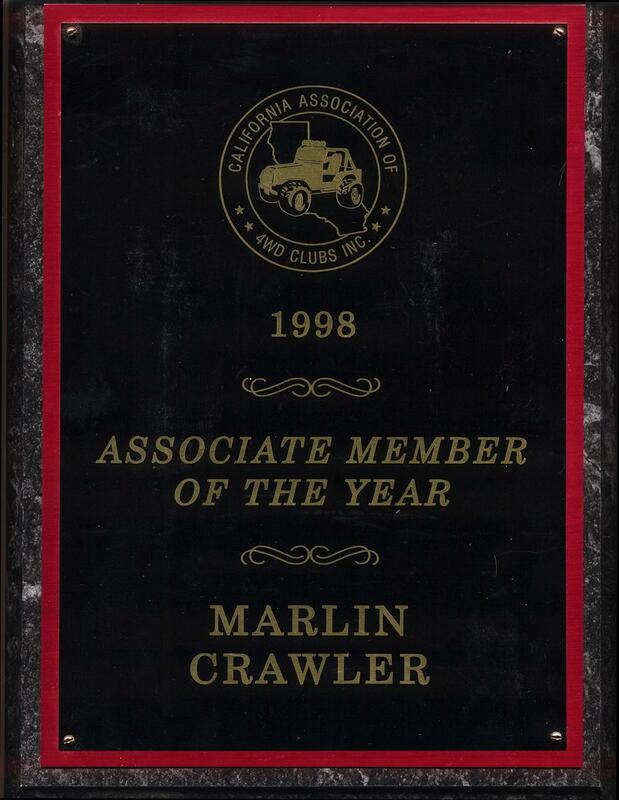 In 1998 Marlin Crawler was awarded the CAL4WD's "Associate Member of the Year"
In 2001 Marlin Crawler was awarded its second "Associate Member of the Year" from the California Association of 4WD Clubs. 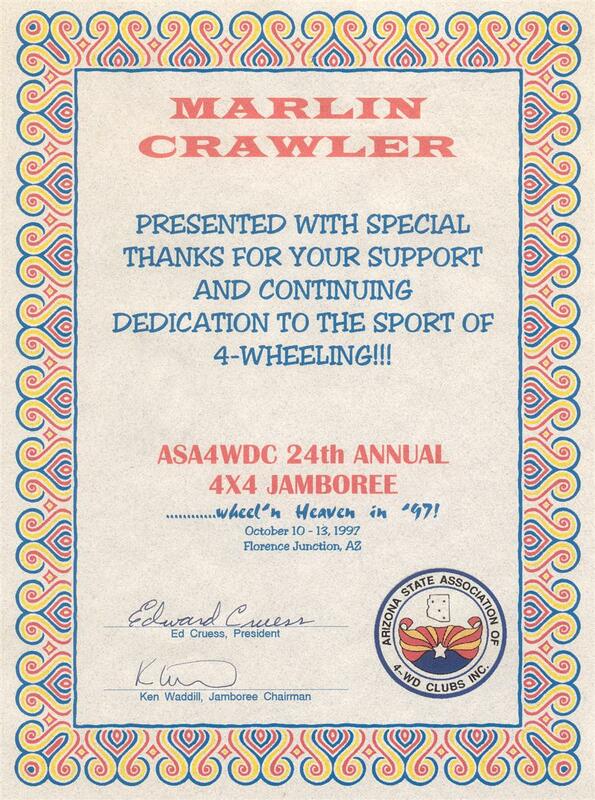 In 2004 Marlin Crawler received a special thanks for its "GREAT SERVICE" from Madera Concepts. 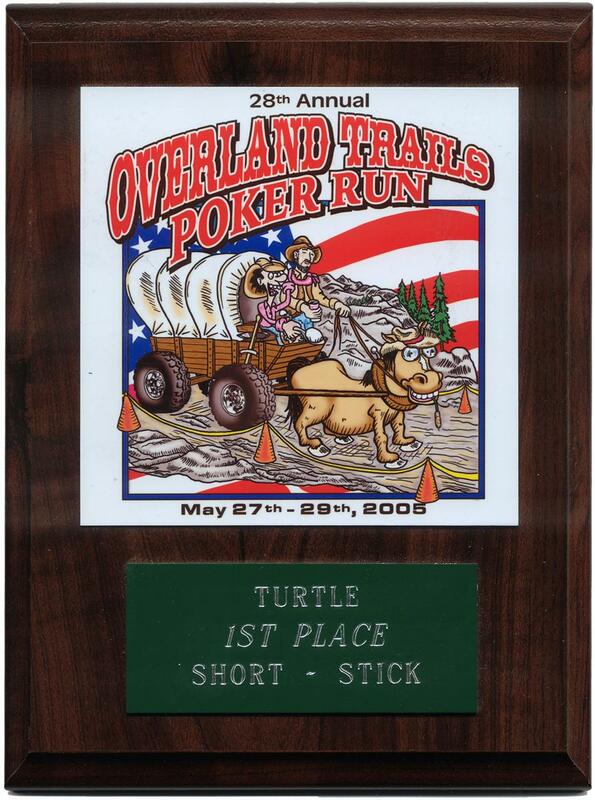 Marlin receives another 1st place Turtle Crawl Award, this time at the 2005 28th Annual Overland Trails Poker Run. 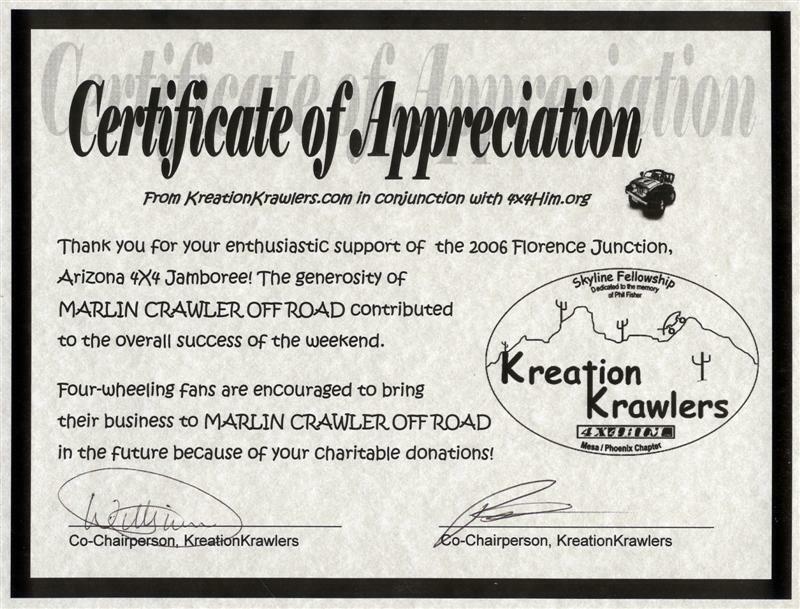 Marlin Crawler receives a "Certificate of Appreciation" from the Kreation Krawlers club of Arizona for their enthusiastic support of the 2006 Florence Junction Arizona 4X4 Jamboree. 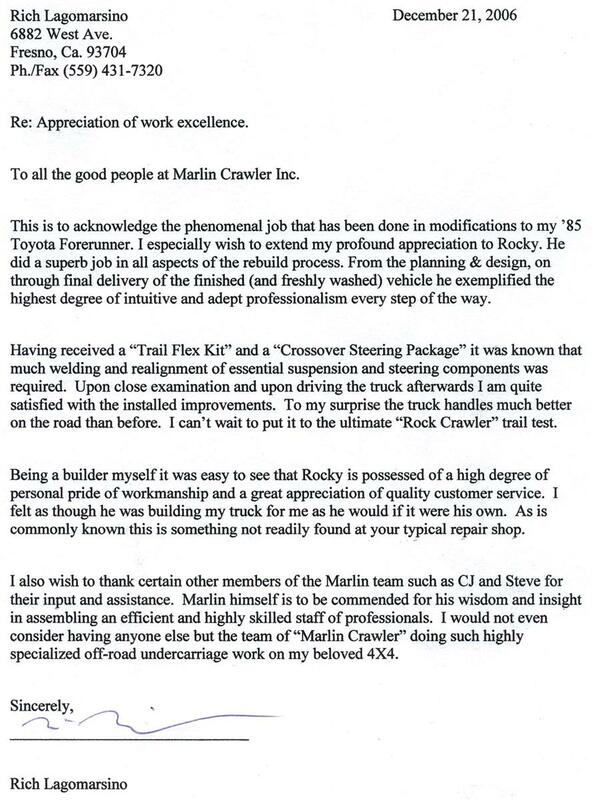 Marlin Crawler receives an appreciation of "Work Excellence" from Rich Lagomarsino for phenomenal work performed in 2006. 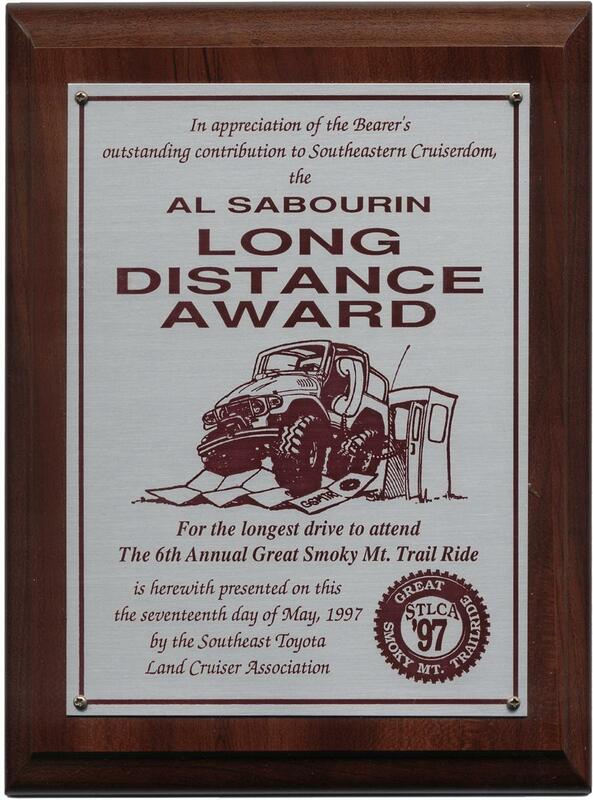 Marlin Crawler receives another Long Distance Award, this time from the Lone Star Toyota Jamboree in 2006. 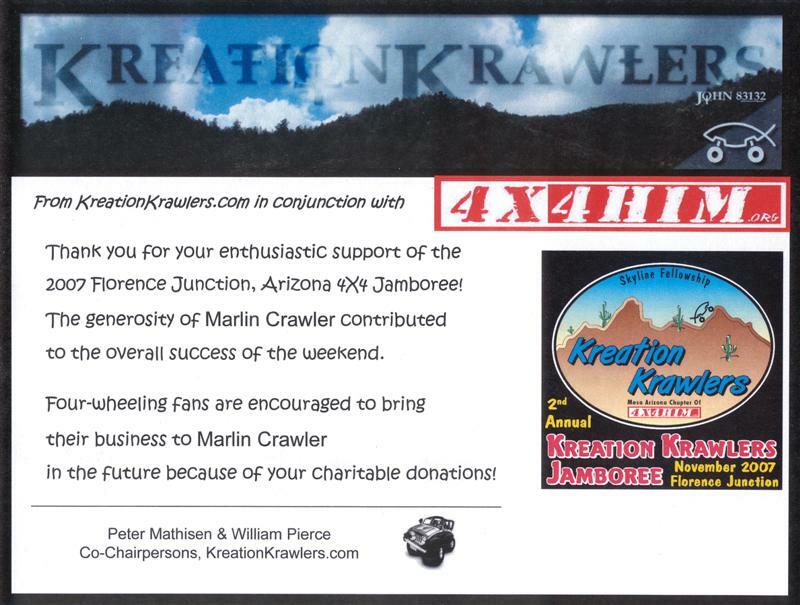 In 2007 Marlin Crawler received another appreciation for their "enthusiastic support" of the 2007 Florence Junction, Arizona 4X4 Jamboree. 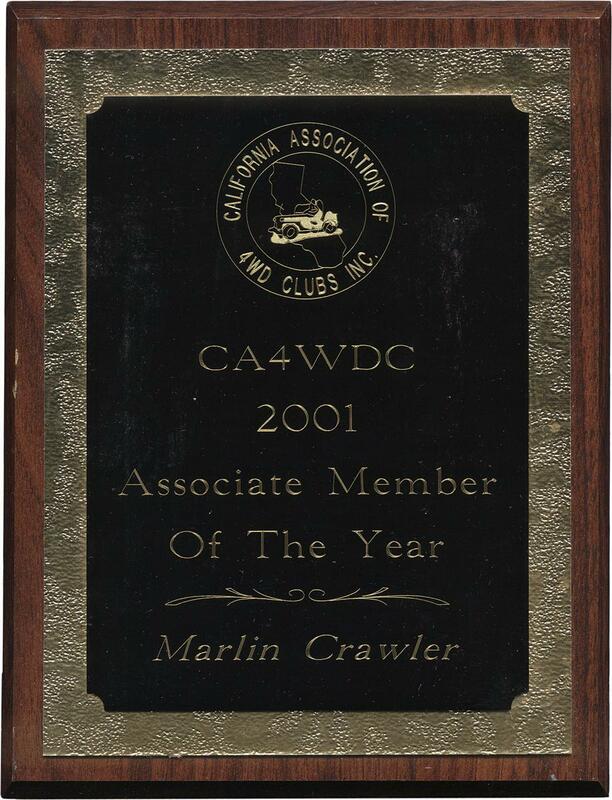 Marlin Crawler is acknowledged for their "generous support" of the TLCA Calico Clean Up of 2007. 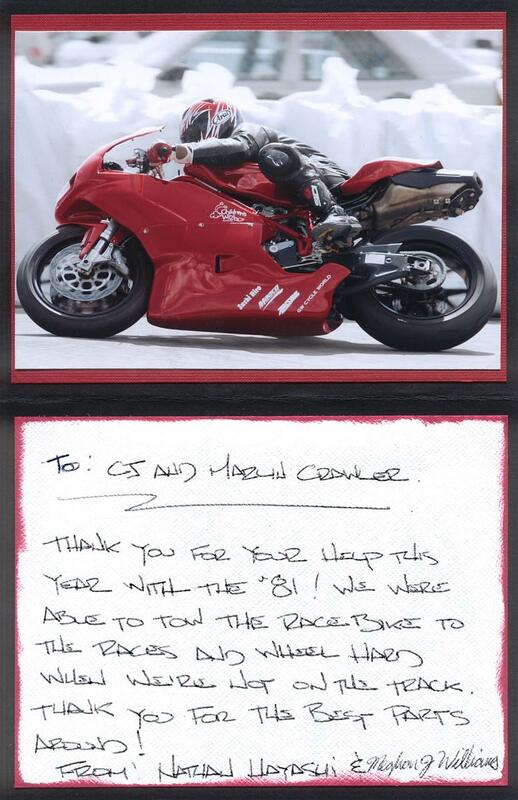 In 1997 Marlin Crawler received a letter of appreciation from Nathan Hayashi for providing the "best parts around!" 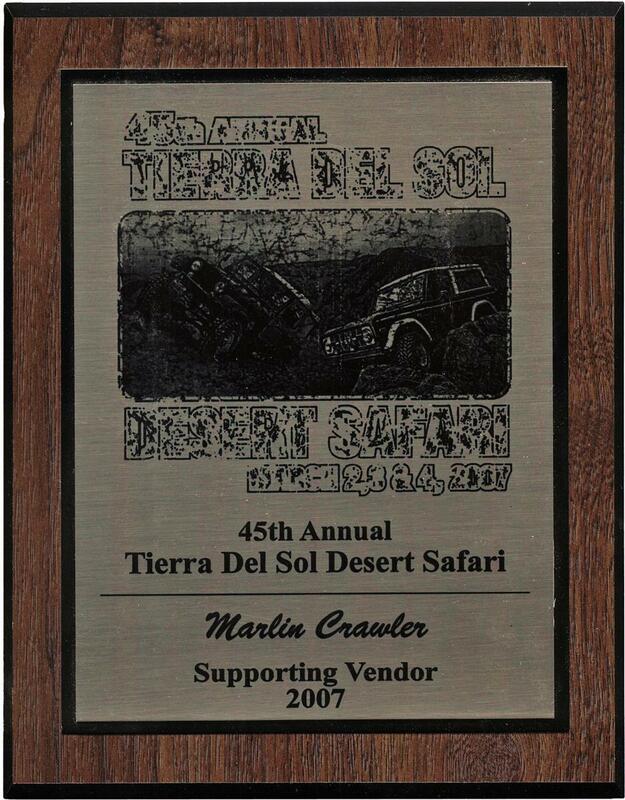 Marlin Crawler receives a special acknowledged as a supporting vendor at the 45th annual Tierra Del Sol Desert Safari in 2007. 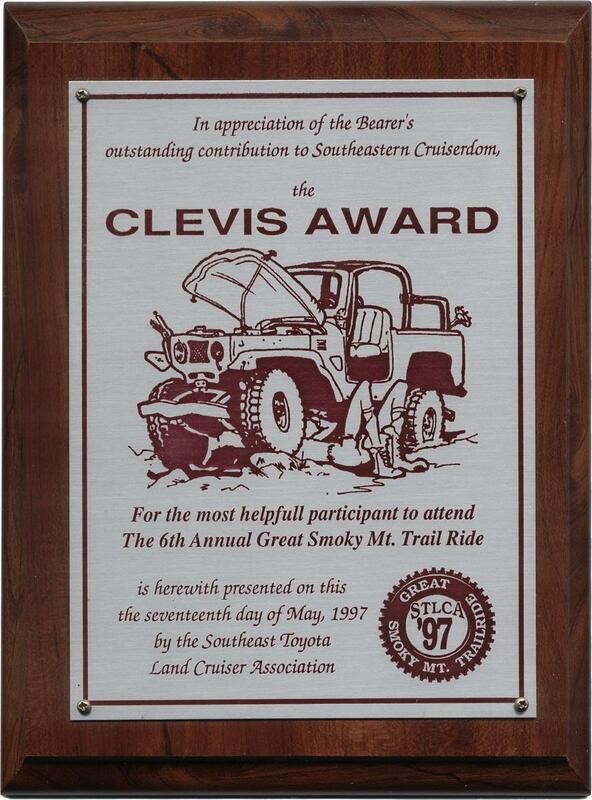 At the TLCA Calico Clean Up of 2008 Marlin Crawler received another acknowledgment for their "generous support". 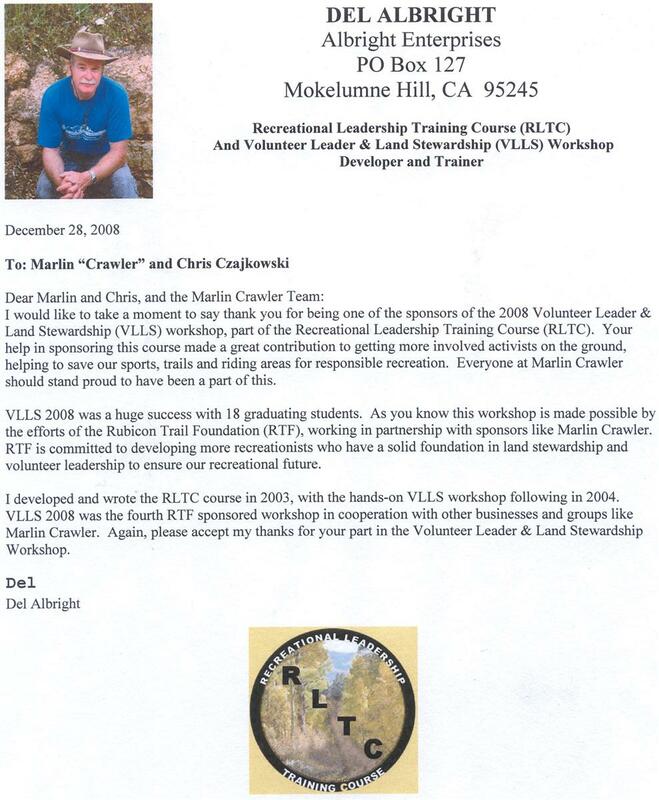 In 2008 Marlin and his wife Christine received a special letter from the prominent land rights activist Del Albright for their contribution to the 2008 Volunteer Leader & Land Stewardship (VLLS) workshop from the Recreational Leadership Training Course program of Albright Enterprises. 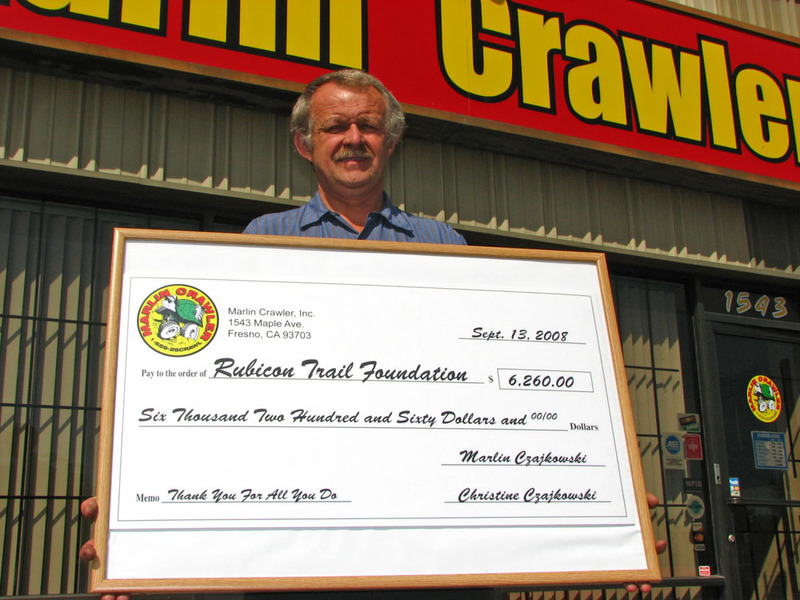 The 2008 Marlin Crawler Round-Up raised $6,260 from the event all of which was donated directly to the Rubicon Trail Foundation. This marks over $10,000 in donations to the foundation! 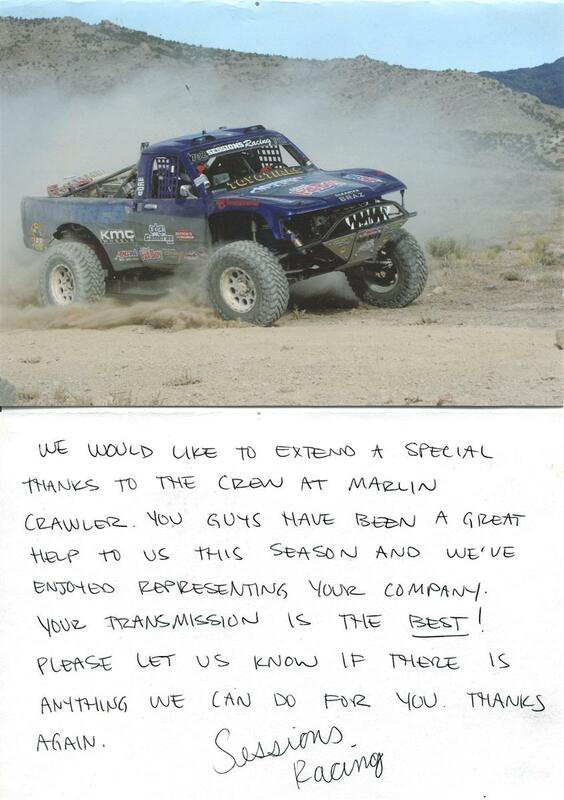 Marlin Crawler receives a "special thanks" from the Brady Sessions and the Sessions Racing Team as having the "best" transmission for desert racing! 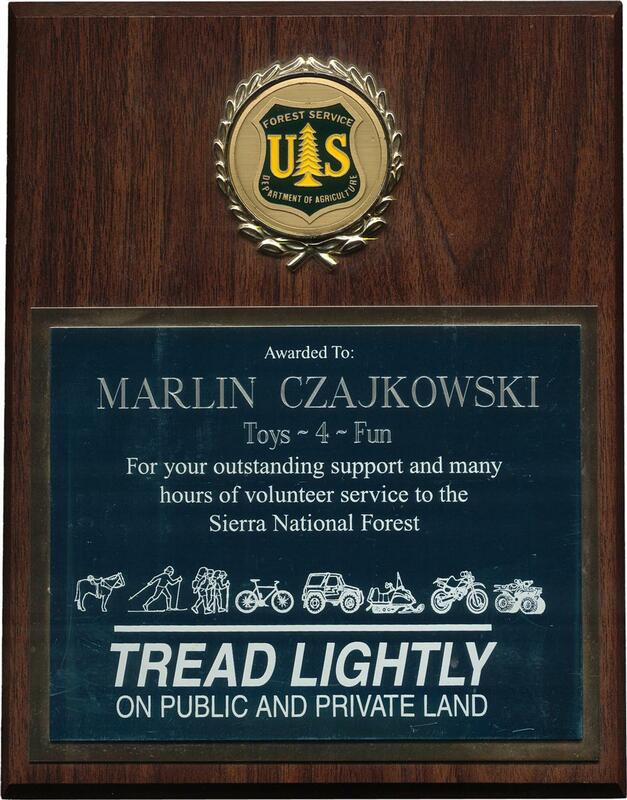 Marlin Crawler has also been awarded by the United States of America Forest Service Department of Agriculture for their "outstanding support and many hours of volunteer service" to the Sierra National Forest and the Tread Lightly program. This is a 3-page letter of appreciation for our "excellent service and truly innovative work" done to a customer of ours in April of 2009. This is a very touching letter that encompasses the true spirit of Marlin Crawler. 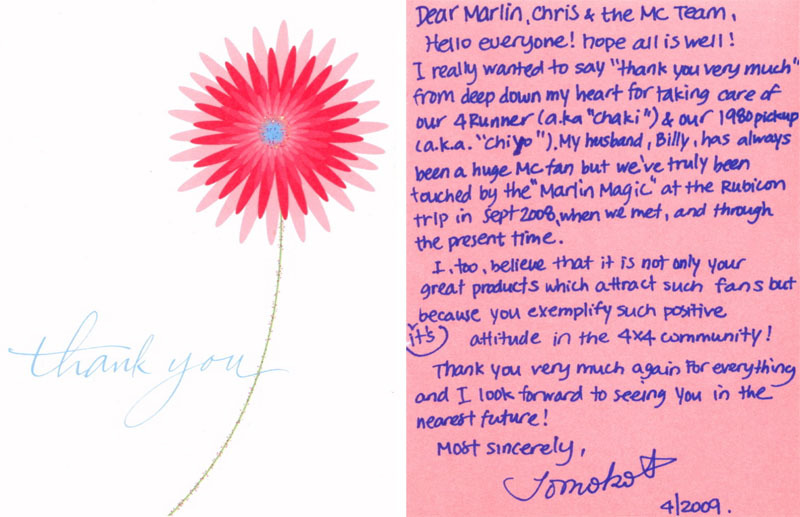 This is a thank you letter from a customer we received in April of 2009 thanking us for our positive attitude that we exemplify in the 4X4 community. 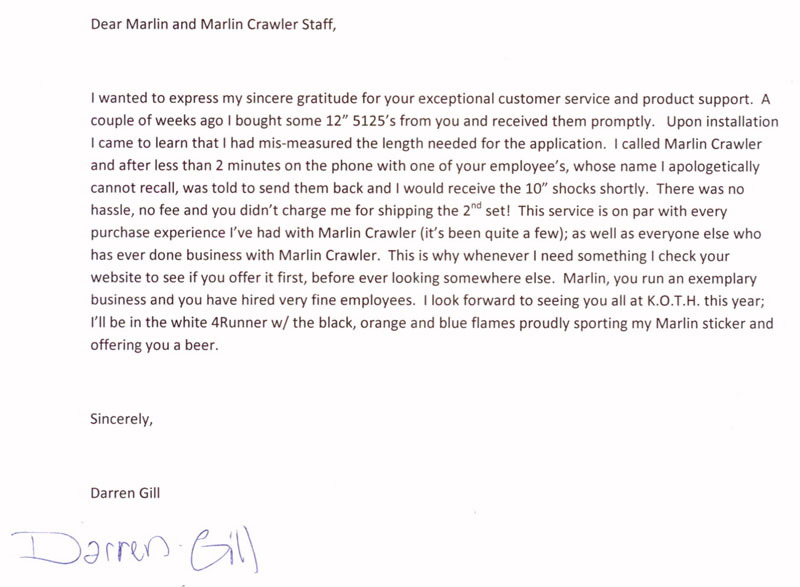 It is letters like these and others on this page that make working at Marlin Crawler truly rewarding. 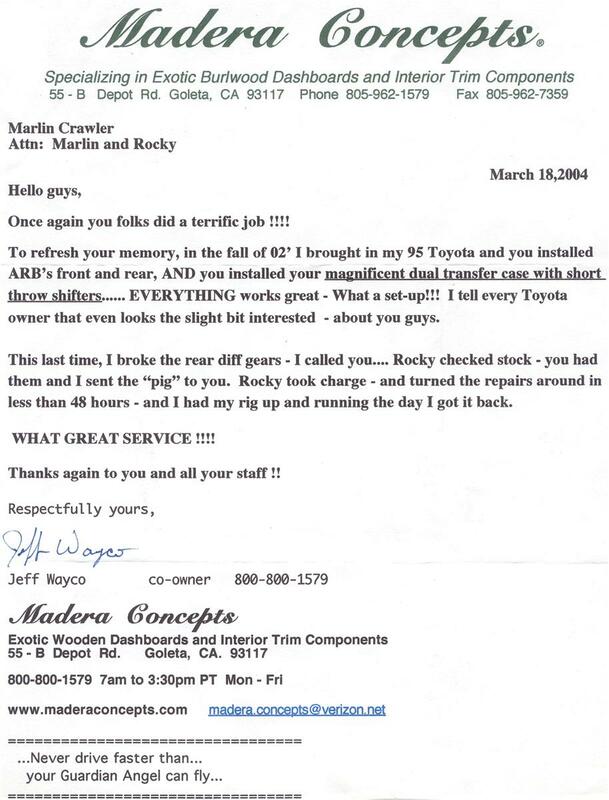 Here is a letter we received in March of 2009 of "sincere gratitude" for our "exceptional customer service and product support" from another satisfied customer. Above is a (partial) representation of the servitude Marlin and Marlin Crawler have lovingly provided to the off-road community. 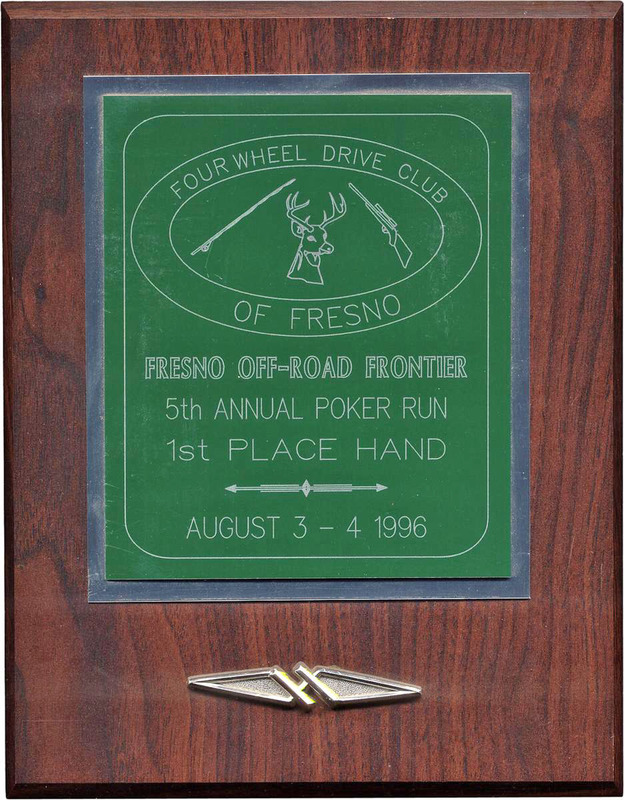 There have been many more awards and recognitions earned than what is presented here. This list will be updated as more are "unearthed" from storage. 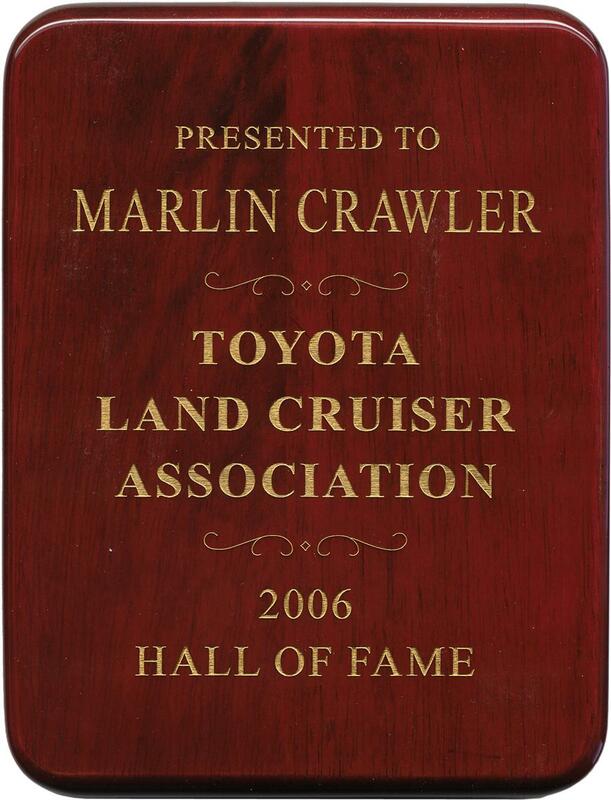 The next time you purchase a Marlin Crawler product, know that you are buying a part of the ever expanding Marlin Crawler Toyota Heritage! Wow, that's what I call a never ending list, and well deserved IMO. Why ? This forum tells it all! The history and the service, beats all. The knowledge is just to cap it all off. WOW.My hat is off to the man. 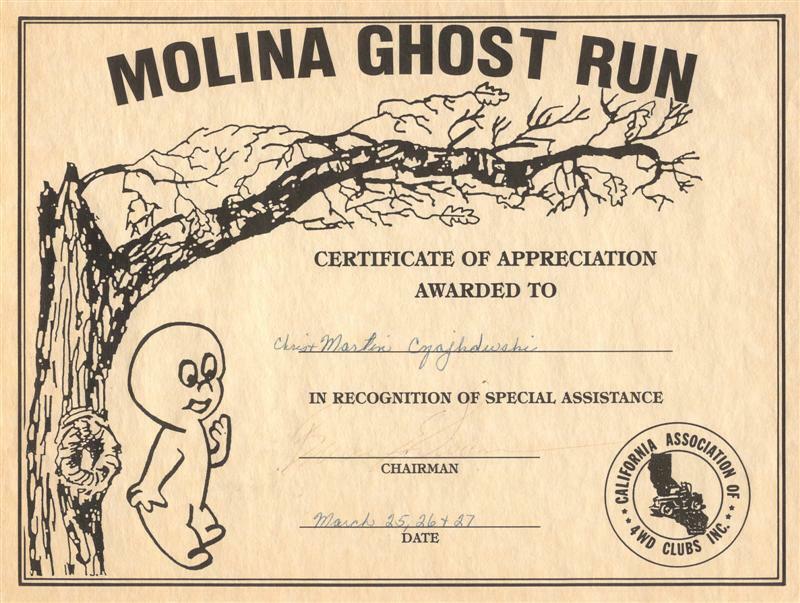 Geez that's some SERIOUS recognition you've had! Way to go keep up the amazing work! Can't wait to see what's next! It's been almost 2 years since I started this thread; I think it's time for an update! Amazing the web site said Marlin has the experience but this really puts it into perspective. Keep up the great work. Absolutely the best customer service I have ever encountered! "Marlin Crawler is an very competent Company, but i ask me, why don`t this Company reply any Emails? If customers have any Questions or Problems, who reply these whole Questions , if nobody is there? Wolves are smarter than humans!!!!!!!!!!!!!! Hello friend. Did you try the customer service board on the store website? That may be a good option if you have not. Awsome! Cant wait to see whats next! New to the scene, after spending an insane amount of time reading about the Marlin Crawler past, present, and what the future may hold, I'm Sold! Help me choose my new car! Page created in 0.329 seconds with 30 queries.